Most guides will do their best to be respectful leaders but be aware – there are some exceptions. Do not hesitate to use your authority as a consumer to create change! Tourists drive this region of the country and locals are willing to do what they must in order to ensure happy, repeat clients. No wise guide will willingly upset his meal ticket and by demanding a responsible visit, you ensure that this will become their focus. 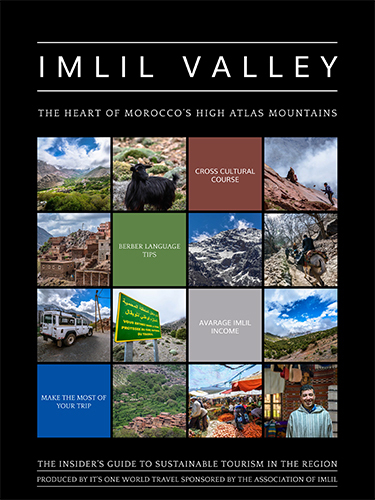 You hold the power to create change and turn the tides of tourism in Imlil as well as the rest of Morocco. Remembering the triple bottom line: environment, economy, and inhabitants the best way to know if a tour company is responsible and ethical is to ask them targeted questions that concern you most. Below are some examples of questions that you would use to vet a company or agency before booking. Does the company hire local employees? Are they also in management roles? Do you pay fair rates to your muleteers, guides, etc? Refer to the Responsible and Respectful Tourism brochure to ensure you understand what constitutes a living wage as well as the seasonal changes in the valley. Download the Responsible and Respectful tourism brochure here to get more info on ideal working conditions for mules. Don’t let animal abuse happen in your name or on your watch. Something to consider is that tour guides may try to cut costs and pay their muleteers very low wages which in turn creates very poor conditions for both the muleteer and his animal. – What is your company’s policy on animal rides? – How often are the mules and horses given breaks? – If you’re using a mule to make camp and it must travel far and carry all the supplies ask how much weight it’s carrying. 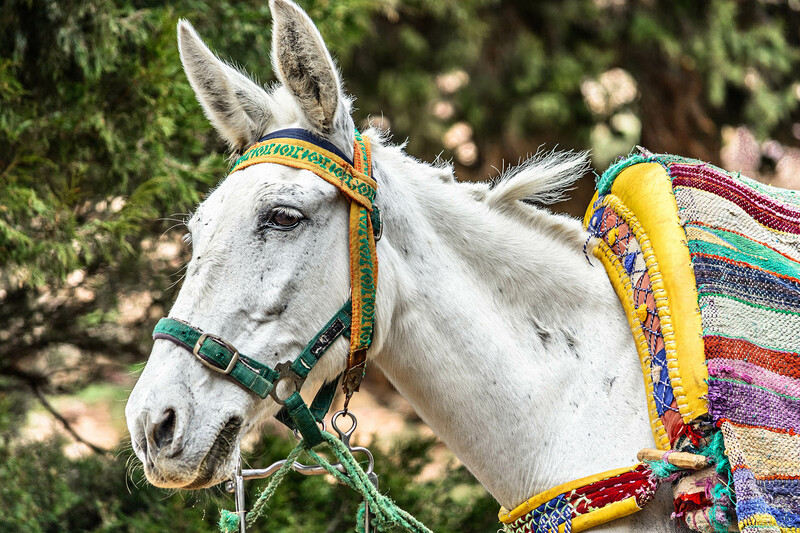 Remember that 75 kilos is the maximum for a mule, and it should be half of that for journeys longer than 20 minutes! Do not hesitate to ask your tour company what they pay their muleteers. If it is not a living wage — insist that you only work with tour operators who care for their providers. Of course, this comes with the obvious result that you can’t expect to pay bargain basement prices — someone is always paying the price, be it human or animal. Finding a fair price that covers the living expenses of everyone involved should be your priority. Be a savvy traveler and find the balance between a decent price and doing the right thing. Striving to leave no trace is a journey that includes your guide. It’s all too easy to pass the responsibility onto your guide as they’re your host but remember that when it comes to being a responsible tourist you make the rules. If they insist that it’s fine to leave your trash in Imlil, if they litter, if they disrespect the code of conduct that you know to be correct you must speak out. For yourself, for the environment, and for future generations. Of course, no one wants to create a negative vibe between yourself and your guide but speaking out is the only way to change things. Remember, you’re paying for this experience. If you go with the flow you are directly contributing to the abuse of animals. – Littering — Let them know this is wholly unacceptable and you won’t stand for it. Trash goes directly into fresh water sources and in some instances takes hundreds of years to decompose. Ask your guide to pick up the trash they leave and tell them that you do not support this. Tell them you would NEVER pay for or recommend a company that does this. A few moments of tension could be the catalyst that creates change in the individual and their entire business model. If you book with a company or person who does a great job caring for the environment, local economy, and social interactions between you and the locals then say so. Mentioning this in your TripAdvisor reviews is also a potent reward and influences others in the area. – We booked with your company because we appreciate how you care for the environment. – Thank you for being a responsible tour operator — we will tell all our friends how you ensure that many generations will be able to enjoy this beautiful landscape! – It’s wonderful the way your company looks after the local people by paying them fair wages for their service. This is exactly the kind of companies we do business with and will be back to support you again. Use your purchasing power to ensure that your guide understands that tourists want experiences which respect the people, animals, and environment of Morocco.